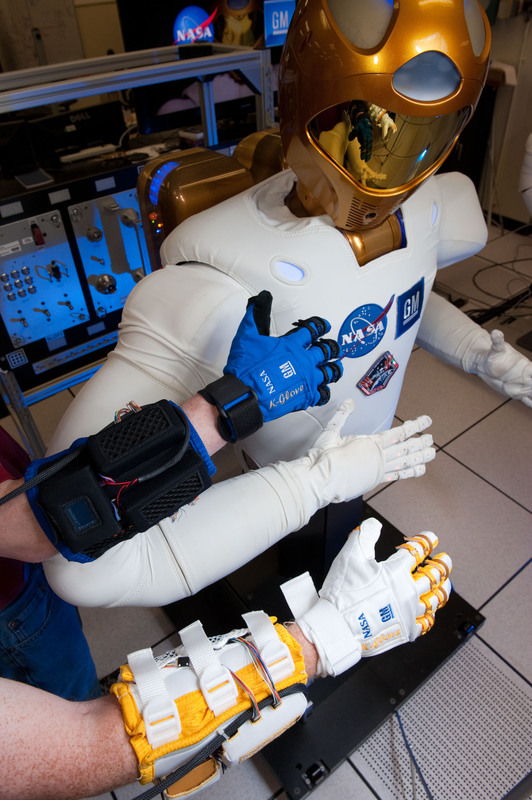 The new Human Grasp Assist device, or Robo-Glove (Credits: NASA ). A successful collaboration between NASA and General Motors resulted in development of Robonaut 2, now aboard the International Space Station. A spin-off collaboration, called the Human Grasp Assist device, has now resulted in a prototype derived from the Robonaut 2 (R2) technology. Generally called the K-Glove or Robo-Glove, the device is a robotic glove which is to be worn by astronauts, allowing them to perform their tasks more efficiently while reducing the risk of repetitive stress injuries. “The prototype glove offers my spacesuit team a promising opportunity to explore new ideas, and challenges our traditional thinking of what extravehicular activity hand dexterity could be,” said Trish Petete, division chief, Crew and Thermal Systems Division, NASA’s Johnson Space Center. The astronaut or worker wearing the K-Glove prototype can hold a tool much longer and without applying as much strength as an unassisted astronaut. The glove is using leading-edge sensors, actuators, and tendons corresponding to the nerves, muscles and tendons in a human hand. The actuators are incorporated into the upper portion of the glove and the pressure sensors are embedded into the fingertips of the glove so that they detect when the wearer is grasping a tool. Immediately, the synthetic tendons automatically retract, pulling the fingers into a gripping position until the sensor is released. The weight of the glove is only one kilogram, including control electronics, a small display used for diagnostics and programming, and a standard lithium-ion battery. An updated version of the glove, which is almost complete, will be even lighter and more compact in size. 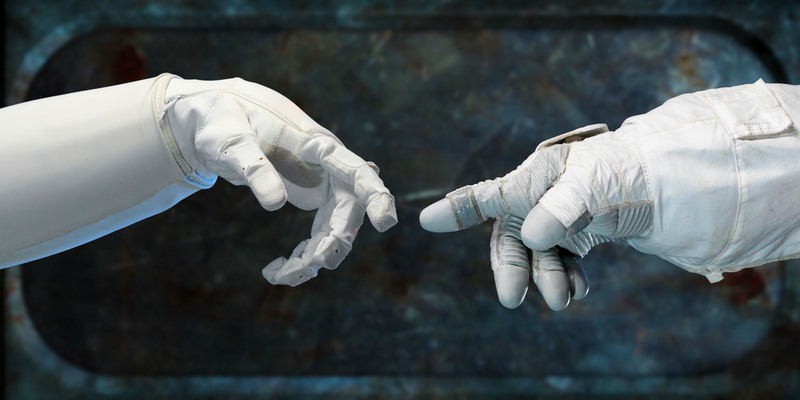 Robonaut and spacesuit-gloved hands are stretched towards each other in immitation of the famous “The Creation of Adam” painting by Michelangelo in the Sistine Chapel (Credits: NASA). One of the design requirements of R2 was for the Robonaut to be able to operate tools made for humans, both in space and in factories on Earth. The extraordinary level of dexterity that was achieved inspired engineers and researchers from NASA and GM to commence the Human Grasp Assist project. In Marhc 2012, the first prototype was completed with the help of Oceaneering Space Systems, who provided the fabric for the glove. The NASA-GM team has submitted 46 patent applications for the Robonaut 2 so far, 21 for the hand and four for the K-Glove alone. According to Ron Diftler, Robonaut 2 project manager, there are more spinoffs expected from the R2. The team is also developing arms based on R2 technology for NASA’s Space Exploration Vehicle. In the video below, you can see a demonstration of the Robo-Glove (Credits: General Motors, 2012).